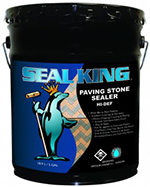 Paving Stone Sealer | Seal King. 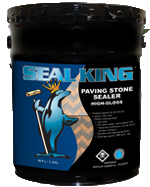 Win the fight against oil, dirt and salt while enhancing the colour of your paving stone with Seal King’s Paving Stone Sealer. Count on a long lasting finish that won’t peel or blister and makes cleaning a breeze. Once the Polymeric sand has dried for at least 28 days. it’s time to seal. 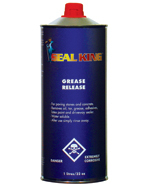 This video shows you how to apply Seal King’s sealer using a pump sprayer. Approx. 100-200 sq.ft. / 1gal. 150 What is Paving Stone? Not sure if you are choosing the right sealer for your stone? 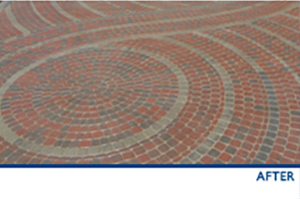 Paving Stone is sometimes called interlock stone. Paving stone is a brick-like piece of concrete commonly used in outdoor flooring. 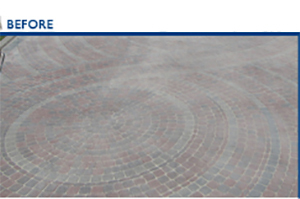 Paving stone is manufactured by mixing a concrete base, other agents and adding colour. Once the ingredients are mixed, it is poured into a mould to set. Paving stone is designed to mimic many natural stones finishes, but again, it is a manufactured product.